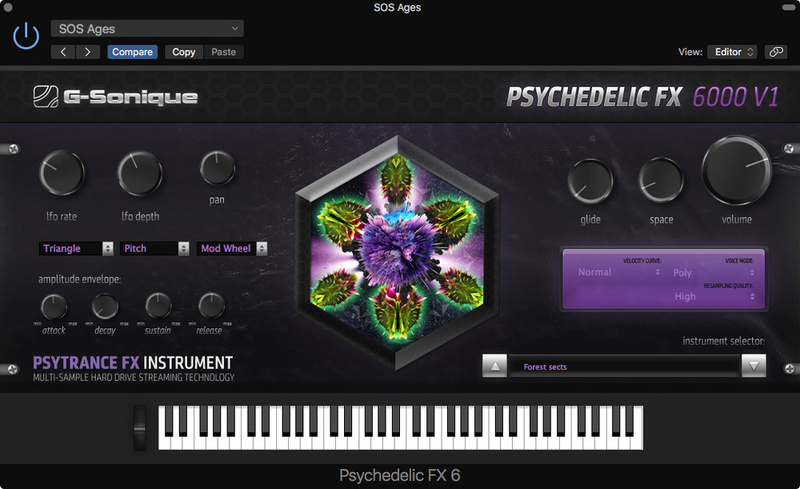 Software instruments range from the massive and deep, such as Spectrasonics Omnisphere, to the very basic. G-Sonique’s Psychedelic FX 6000 V1 definitely inhabits the simpler end of the spectrum. Perhaps the best way to describe it is as a generator of short sample-based musical punctuations that can be tweaked by the user to a limited but useful degree using the included envelope and modulation controls. Certainly, it is designed to fill a niche rather than to compete head-on with the majority of existing products. A free demo version with around 30 sounds is available, but the full version includes over 140 sounds, with the possibility of more being added at a later date. There’s just over 1GB of sample data, which includes blips, sci-fi ray guns, sweeps, whooshes, bubbling washes, arcade-game booms, voice-flavoured robotic sounds and some useful sequence elements. An LFO with a choice of waveforms can be used to modulate volume, panning or pitch, with mod depth controlled from a mod wheel, velocity or simply the Depth knob. The instrument offers Mono, Legato or Polyphonic playback modes and we’re told that it uses special multisample/multi-octave hard-drive streaming technology to save on RAM use, with a special interpolation technique used to keep the samples sounding clean over a wide range of pitches; the user can select from three resampling sound quality options to conserve CPU resources, as a creative choice. There’s also a familiar ADSR envelope shaper, a glide time control that works in the Mono and Legato modes, a velocity curve selector, pitch-bend options and a basic reverb effect operated using the Space knob. The control set is so simple that you can find your way around Psychedelic FX 6000 V1 in minutes — and that’s all part of its appeal. Most of the samples seem to last between three and five seconds, and many have no readily identifiable pitch centre, so although you can play the sounds polyphonically, most work best in Mono mode. Much of what’s on offer is admittedly very familiar fare within the trance, dance and EDM genres, and if you have the patience you could probably create similar sweeps, rises and stabs using the synths and effects you already own. However, given the low cost of this instrument combined with its ease of use, it is the instant gratification aspect that will appeal. The resampling is very effective, and even dragging a sound down by three octaves produces a smooth result. Furthermore you can follow the plug-in with your own effect plug-ins to make things more interesting, for instance by setting up a short sequenced element, passing it through a peak EQ and then sweeping the EQ frequency. The result is instantly familiar but no less usable for that. I would have liked the option to add my own one-shot samples to the library, and some of the sounds might have benefitted from being longer, but other than that, Psychedelic FX 6000 V1 is a very attractive proposition for anyone creating the style of music that can make use of this type of ear candy.